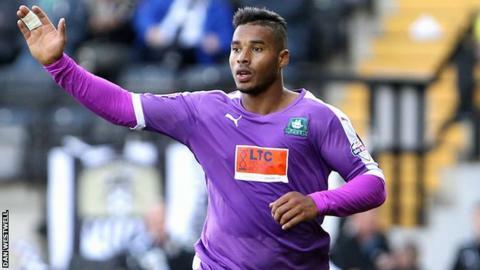 Plymouth Argyle manager Derek Adams is pleased with how his side are coping with the loss of striker Reuben Reid. The 27-year-old, who has scored six goals this season, has missed the last month with a hip injury. Despite being without their leading scorer for the past two seasons, Plymouth are still five points clear at the top of League Two. "We've got other people who can score, but would I like Reuben Reid back in the team and competing? Yes," he said. Adams has refused to put a date on when Reid might return from his latest injury setback. The former West Bromwich Albion and Yeovil forward had foot surgery in the summer to correct a problem which affected him during last season's run-in. "We've missed him, but we haven't missed him too much because we've scored three goals and we've won games," he added to BBC Radio Devon. "Reuben is a good player for us. He's missed seven games for us already this season, which is a blow for him, but he's a top player. "But we've got other players in the team that can score goals. We've got Jake Jervis who's the top goalscorer and Graham Carey who's the second-top goalscorer."